We've got dogs, and we know where your hands are going. 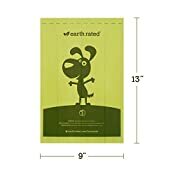 We want them to stay safe, clean and poop-free which is why we guarantee our Earth Rated dog poop bags are 100% leak-proof, extra thick and strong! Even though our bags are super tough, they're still easy to use so you're not fumbling around when it's time for business. When you do head out to bag poop, we recommend matching our refill rolls with our Earth Rated leash dispenser so they're always close by. The extra details are important to us, which is why all of our packaging and inner roll cores are made with recycled materials. 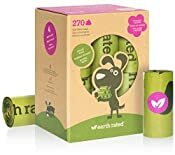 This box of 270 doggy bags contains 18 rolls of 15 lavender-scented dog poop bags, and each dog poop bag measures 9 x 13 inches. They're big enough to fully cover your hand and sleeve during pickup with plenty of room left over to tie a secure knot in the bag when you're finished. We've managed to make these awesome bags because we love dogs and love what we do, so we hope you'll try them and let us know if you have any feedback!